When Rick proposed to me, it took us less than an hour to start dreaming of our honeymoon. In fact, we had our dream honeymoon planned before I even started thinking about the wedding day. We knew we were right for each other when that dream honeymoon included sandy beaches, coral reefs, and a resort with a pool-side bar. The only thing we weren't sure about was how we were going to pay for this great vacation; Rick had just started his own business and we were living on a pretty tight budget. I remember wishing there was some way to register for the honeymoon rather than registering for stuff. On a lark, I did a Google search for "honeymoon registry." We came upon Traveler's Joy and the key to our dream trip. We were thrilled! And we loved the freedom Traveler's Joy gave us to invent the trip, and tell a story to our friends using the honeymoon description section. Now we just had to find the place. Rick couldn't take more than a week for the honeymoon, so we wanted something close. Fortunately, the Caribbean is only a few hours by plane from us. After weeks of researching various options (we did much more research for the honeymoon than we did for the wedding) we decided Puerto Rico sounded perfect for us-it was close, we could dive the reefs and hike the rainforest, and the resorts were exactly what we were looking for. And, we could have our dream vacation within our budget-we wanted to keep the entire trip to under $5,000. 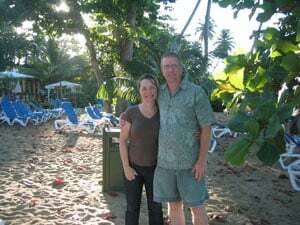 The Rincon Beach Resort in Rincon, Puerto Rico was our winning destination. It met all of our criteria-even the cost! Our package was 7 nights, 8 days, plus airfare from Washington/Dulles to Mayaguez, at a cost of $2,500 ($1,250 each). October is off-season, so that may have helped with the cost. But the weather is still beautiful that time of year. Location set, we sat down to plan our activities. Traveler's Joy had suggested being very specific about what we wanted, so we were. 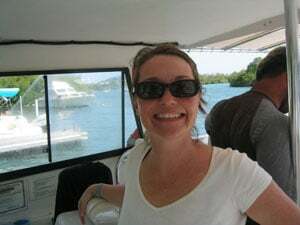 We asked for the usual things, like dinner at specific restaurants; snorkeling, and sailing excursions. But it was the silly stuff we got: a supply of xanex to give me the courage to get on the 8-seat Cessna from San Juan to Mayaguez; SPF 75 suntan lotion; a box of Godiva chocolates waiting in the room. We gave our friends many options at a variety of prices, and wrote the pages to tell a story. They loved it! One friend said she kept going back and reading it over and over because it was so much fun. It was fun to see how excited our friends were about contributing to our memories. In the end, we got just under $4,000 in gifts on Traveler's Joy-more than enough to ensure we didn't have to skimp on anything we wanted to do. The adventure started early the Thursday after our wedding at Dulles Airport, where we had trouble figuring out where to check in. We had an ancient thing called "paper tickets," which most airlines don't use anymore (unless it's a very tiny airline that only has tiny little planes.) After a little trauma and much lugging of our luggage around the airport, we found someone who knew what to do with the tickets, and we were on our way. The flight to San Juan was totally uneventful...just how I like my flights. We arrived in Puerto Rico to clear blue skies and calm waters. Even the flight to Mayaguez on the itty-bitty plane was okay. I was a little disconcerted when I had to tell the pilot how much I weighed before I got on the plane, but as soon as we were airborne, I put that behind me. The beaches were gorgeous, and we could see the reefs just offshore. It was perfect. The Rincon Beach Resort was exactly what we imagined, although we almost drove right past it...we quickly learned that street signs in PR are pretty much non-existent. The resort was undergoing some remodeling, but they were doing a good job of containing the mess and noise so that we didn't really notice it most of the time. When they learned we were honeymooners, they upgraded us to a suite, where we quickly donned our bathing suits and hit the beach. We found a couple of lounge chairs under the shade of mangrove trees, but we didn't sit...instead we headed into the water for an afternoon of body surfing and shell hunting. We spent our first evening driving around Rincon, looking for the dive shops we read about. This is when we learned that going to the West side of the island off season is a little risky...if you're planning a dive vacation. Off season, most dive operators only go out on the weekends and only if they're boat isn't being repaired. Long story short, none of the Rincon-based dive shops could take us out. That meant we wouldn't be diving the Marine Preserve at Desecho Island. 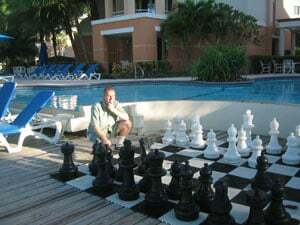 Fortunately, I had made arrangements before we headed to Puerto Rico to finish my open water certification in Parguera-an hour drive from our resort-over the weekend. It worked out for the best: The dive master at Parguera Divers was fantastic, and he made sure the experience was fun for me, even when his boat broke down on Sunday. 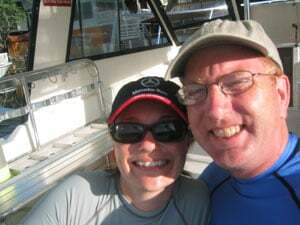 In fact, he went out of his way to fix the boat enough for me to finish my certification, and then took us out for a spectacular dive trip on Wednesday. It was worth all the driving-Efra's wall in Parguera is spectacular, and I went down to 90 feet on my first official dive. I felt like I was in an underwater city. There were thousands of sea creatures, each going about their usual business. It was amazing beyond anything I had imagined. Rick was especially excited to see a Moray eel pop out of his hole to investigate us. The big guy was at least 12 feet long. Fortunately, he didn't think we were all that interesting, and quickly retreated back in his hole. We spent our first morning snorkeling off the resort's beach, where we found beautiful sand dollars. Later, we attempted to go on a hike in the rainforest, and I'm sure if there had been any street signs we could have found our way. Alas, we spent two hours driving twisting, narrow roads up into the mountains. Finally, hunger made us stop at a very cute roadside café, of which there are hundreds on the island. Perhaps it was the hunger, but our ham and cheese sandwiches were amazing. After that, we decided to head back to the resort so we wouldn't miss our massage appointments. Since Rick is a massage therapist, our vacations always include getting a quest for the best massage the locale has to offer. In this case, one of his clients had been to Rincon and had an amazing massage and referred the therapist to us. We arranged for her and the resort's massage therapist to come to our room for a couples massage. Both therapists were incredibly skilled, and we were very, very relaxed after! In fact, we were so relaxed that we were barely able to stumble down to dinner, and I'm pretty sure our waiter thought we drunk. 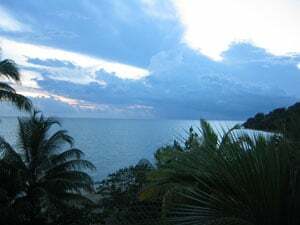 The West side of Puerto Rico is famous for the surfing, and as such Rincon is actually a surfer town. One morning we found our way to the surfer beach to watch the surfers catch the waves. There are some great little burger joints in Rincon as well, staffed by California transplants. When we weren't diving-or driving down to Parguera-we really didn't venture out of the resort much. With the beautiful beach and inviting pool, the resort offered us what we needed: peace and quiet! Our room was incredibly comfortable, and the staff were lovely. In fact, we're planning on going back for our 5th anniversary.